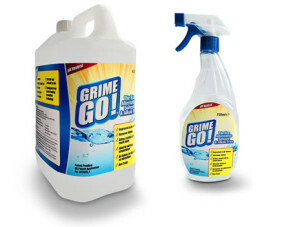 Grime Go is a heavy duty cleaner with a kind heart. It is Produced by Eco Solutions who make solvent-free cleaning and stripping products that are ecologically friendly. We like them because they are produced in the UK, they are safe and easy to use, and they really do work. Eco Solutions products include eco-friendly Artex remover (see our project on Artex removal), and graffiti remover as well as paint and varnish stripper, and a neat product for restoring paint brushes that have become stiffened with dried paint called Brush Renew which we also have a video guide for. Their latest innovation is Grime Go which can be used for household cleaning, and by DIYers and builders to remove almost any unwanted coating from almost any surface! You can use Grime Go for preparing surfaces for painting. The area you want to paint or varnish must be clean, but should also be grease-free in order for the paint to adhere properly. See our project preparing woodwork for painting. Use a nylon scourer to remove heavy residue, or simply wipe off to remove grease and grime. Like any cleaning product prolonged contact with the skin is not recommended and if you are removing anything potentially toxic using Grime Go you should wear the appropriate safety equipment (gloves, safety glasses and mask). All the additional information and advice about Grime Go is available on the Eco Solutions website, and Grime Go is available in our DIY Superstore. See the Video Guide on how to use Grime Go to remove grease for DIY and decorating below. See our special offer bundle on Homestrip products by Eco Solutions in our DIY Superstore.